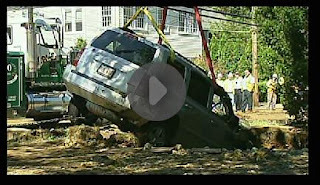 A 35 year old man from Lexington, Boston, Massachusetts, made local news after a series of accidents caused a sinkhole to swallow his Jeep Patriot. The accident occurred 6:30am on a Tuesday morning when the sliver Patriot ploughed into a telephone girder and then pounded into a fire hydrant, which flooded the surrounding area, causing the earth below to collapse. Luckily, the driver suffered minor injuries.